Agni and his sister, Luna, live in a frozen Earth cursed by “the Ice Witch.” The siblings are also among those known as “The Blessed,” people born with abilities to perform miracles. Not all of “The Blessed” are friendly. Some are murderers, like the man called “Doma.” He is blessed with the power of fire, which he uses to destroy Agni and Luna's village and to kill Luna. Doma engulfs Agni, who has regenerative powers, in a flame that will never extinguish. Now, Agni is a walking man of flame, seeking revenge. Fire Punch, Vol. 3 (Chapters 19 to 28) opens as Agni prepares for the filming of the climax to the story of his revenge. The director, Togata, has plans for Agni and her film that she has not shared with her star, but she is also about to discover some surprises. As Agni prepares to face his most dangerous opponents, his heart fills with a new resolve. It is time for a revolution! THE LOWDOWN: The Fire Punch manga opened with surprises and continues to offer surprises. This tough-minded, dystopian thriller goes in unexpected directions, practically with every chapter, and it is quite imaginative. 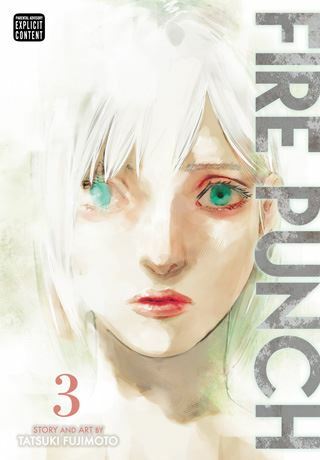 Fire Punch Graphic Novel Volume 3 sees Agni take a surprising turn, one that seems to change the character or at least his goals and motivation. Creator Tatsuki Fujimoto offers this transformation during some excellent battle manga; the fight with Daida is like a superhero fight. The shock ending will delight regular readers, and it makes me want to encourage new readers to start at the beginning and catch up quickly in order to enjoy Vol. 3's ending.